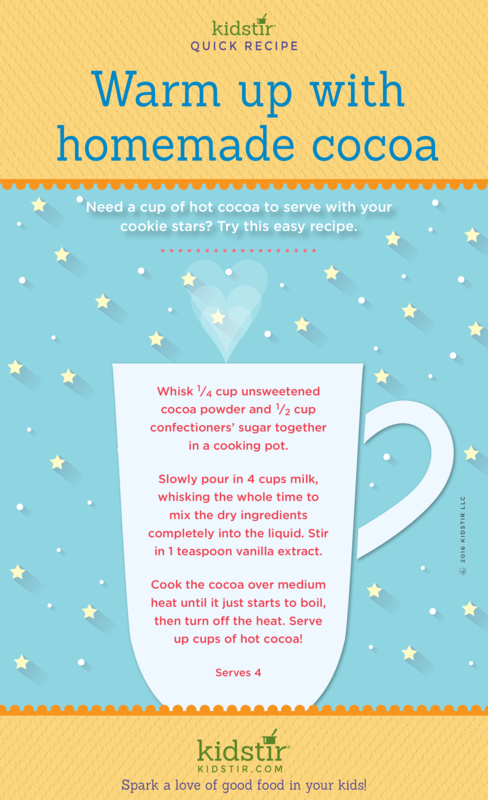 Need a cup of hot cocoa to serve with your cookie stars from your Winter Wonderland Cookies Kit? Try this easy recipe. Whisk 1/4 cup unsweetened cocoa powder and 1/2 cup confectioners’ sugar together in a cooking pot. Slowly pour in 4 cups milk, whisking the whole time to mix the dry ingredients completely into the liquid. Stir in 1 teaspoon vanilla extract. Cook the cocoa over medium neat until it just starts to boil, then turn off the heat. Serve up cups of hot cocoa! With a bit of planning and prior preparation, you can add marshmallow stars to float atop your hot cocoa too! (The homemade marshmallow stars need to set overnight, so get them ready the night before). Add our hot cocoa stick stirrers to make it a winter cocoa party for kids! We’d love to offer the Kids Table Setting Infographic for you to share on your blog. Just select and copy the code snippet below and paste into your next blog post. 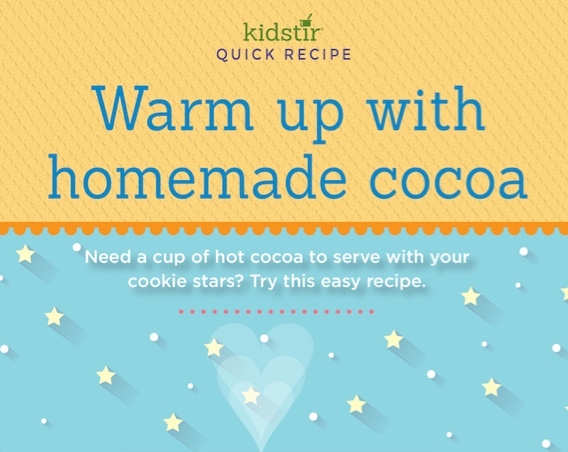 We’d love for everyone to share this page on social media or email using the buttons below so all the kids you know can enjoy making a simple hot cocoa recipe! Next post: Souper Kitchen Fun!